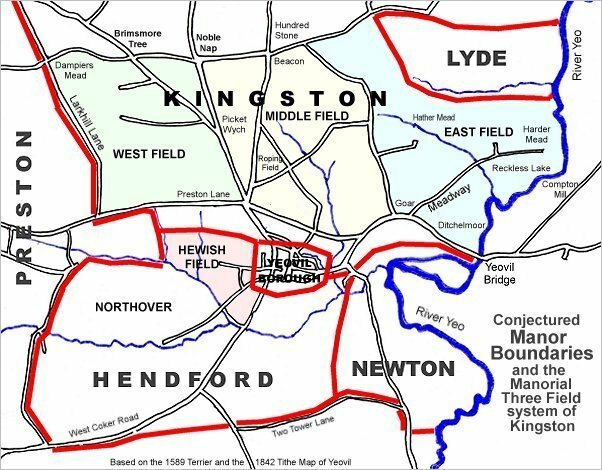 Home Sleight (Parcel 918) was a large field, rising steadily from south to north, originally within the great East Field of the Manor of Kingston. The word sleight, also spelt slaight or slite, derives from the Old English slœget meaning a sheep pasture. The 'home' part of the name means it was the sheep pasture by the home, in this case being Little Lyde Farm. Certainly in 1863 (see below), and probably much earlier, it was known as Barn Close - presumably because of such a structure once built on it. 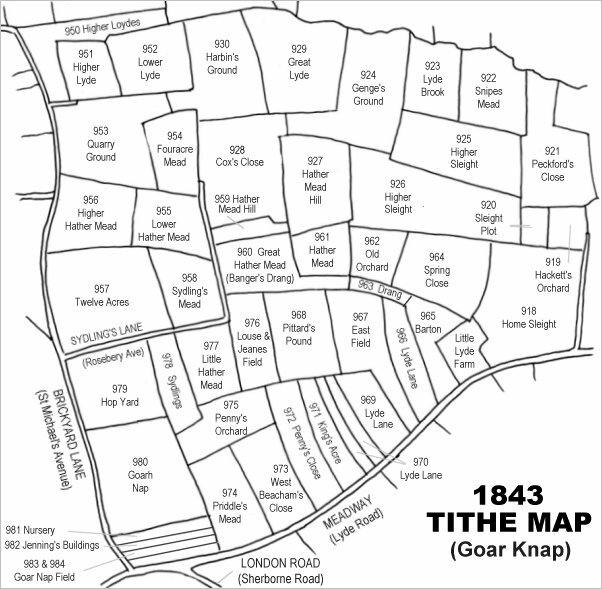 At the time of the 1846 Tithe Apportionment Home Sleight was owned by Sarah Rose and let to Charles Marsh. It was used as pasture for grazing livestock and measured 10a 0r 0p. A small portion of the field was partitioned off and was in separate ownership. It was listed as 'In Home Sleight' (Parcel 918a). This was owned William Hawker Helyar and also let to Charles Marsh. Measuring 1a 3r 0p, it was also used as pasture. Home Sleight was bounded on the south by Lyde Lane where it veered northeast (now the line of Vale Road) after passing Little Lyde Farm. To the east it was bounded by a field access track, to the north it was bounded by Hackett's Orchard (Parcel 919), Sleight Plot (Parcel 920) and the southeast corner of Lower Sleight (Parcel 926). To the west it was bounded by Spring Close (Parcel 964) and Little Lyde Farm (Parcel 965). By the time of the 1946 aerial photograph seen below, Home Sleight remained an open field in the junction of Lyde Lane and the field access track running north - both visible in the photograph. 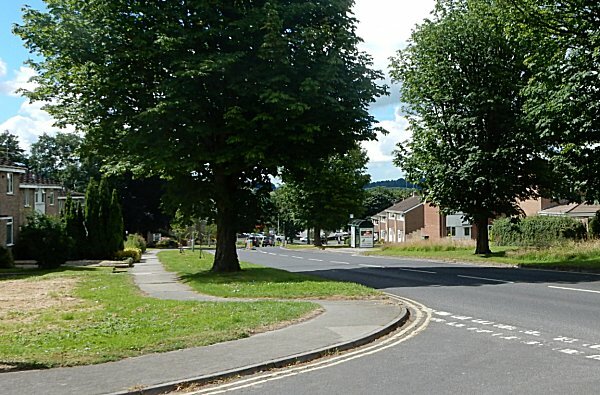 In the late 1960s / early 1970s Meadway, today's Lyde Road, was extended from the point where Lyde Lane veered off northeast at Little Lyde Farm. The new road extension ran through Home Sleight from its southwest corner, then curving to run north and exiting Home Sleight at the centre of its northern boundary. Today the former Home Sleight encompasses part of Howard Road Park in the southwest, houses and gardens of the eastern end of both Arundel Road and Howard Road to the west. 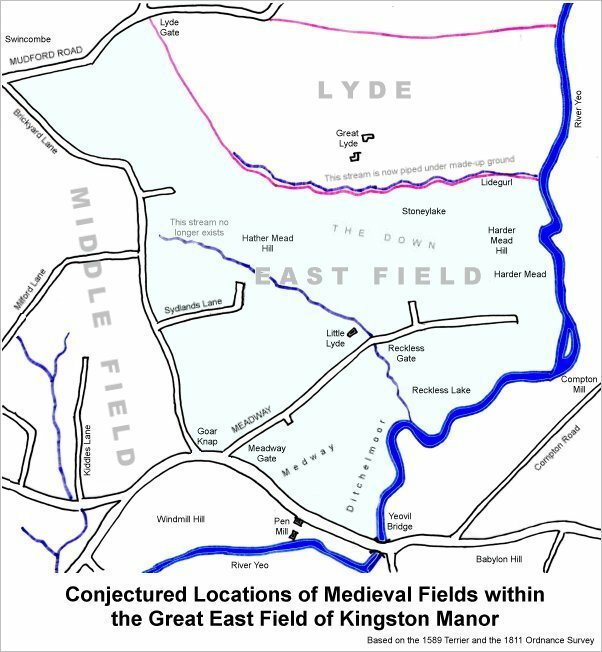 In the east it includes all the houses and gardens between Lyde Road and Oxford Road from Vale Road in the south, almost as far as Belvedere Road. 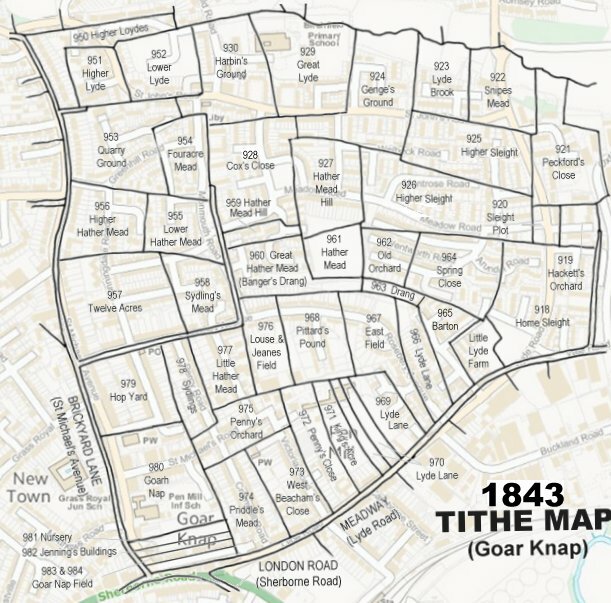 DDrawn from the 1846 Tithe Map with field names added from the 1846 Tithe Apportionment, with Home Sleight (Parcel 918) at centre right. 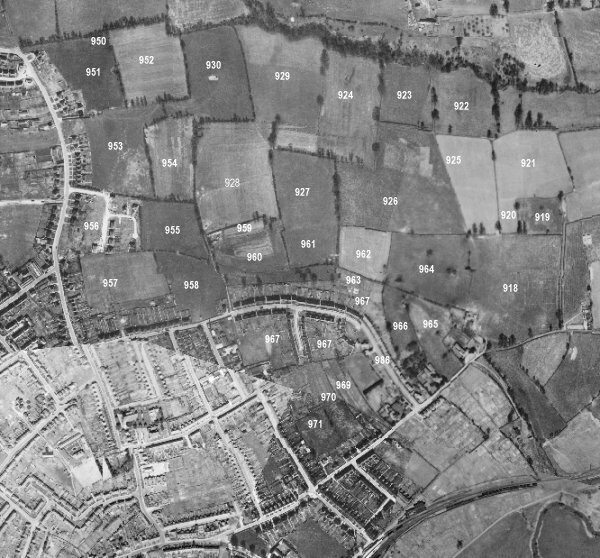 The 1946 aerial survey photograph (somewhat is-aligned at bottom left) with parcel numbers of 1846 plotted on. 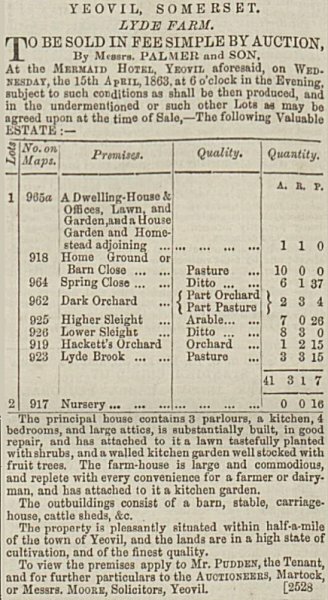 This notice of the sale of Lyde Farm was placed in the 9 April 1863 edition of the Dorset County Chronicle. Photographed in 2016 looking south along Lyde Road. This was roughly the northern edge of Home Sleight which encompassed pretty much everything in this photograph.